I haven't done one of these Sunday Road Trip posts in a while, so when I found myself with a little time recently, I headed out to visit a bygone era along Route 66 in the Mojave Desert. 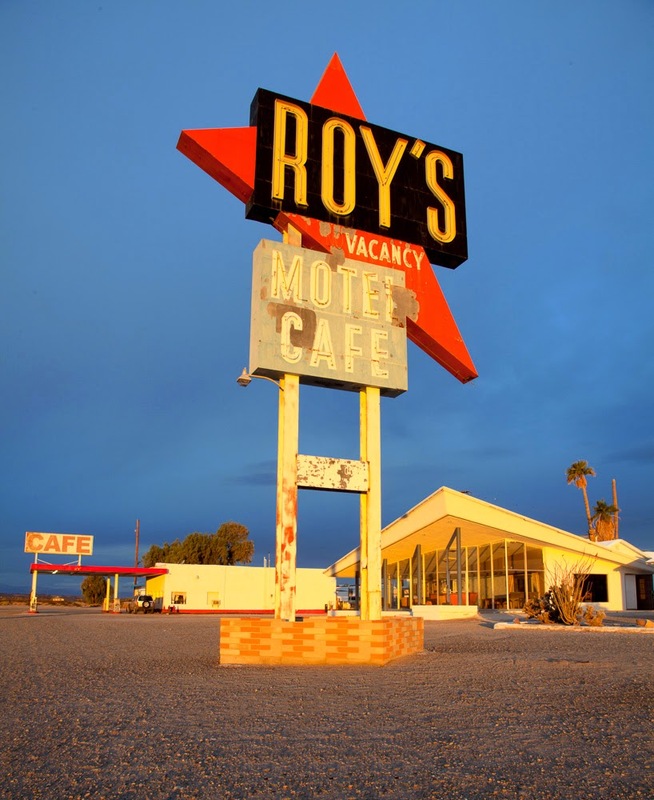 Roy's Motel and Cafe in Amboy, California. 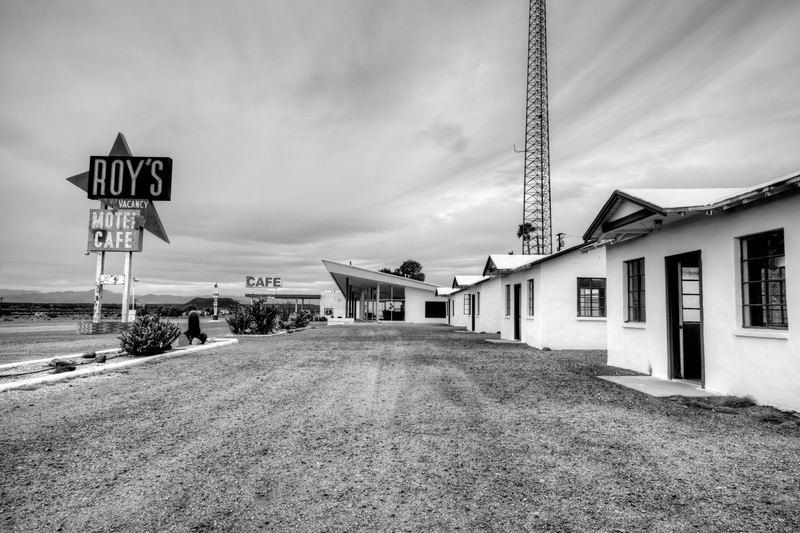 Roy's was built in that instantly recognizable Googie style of architecture. 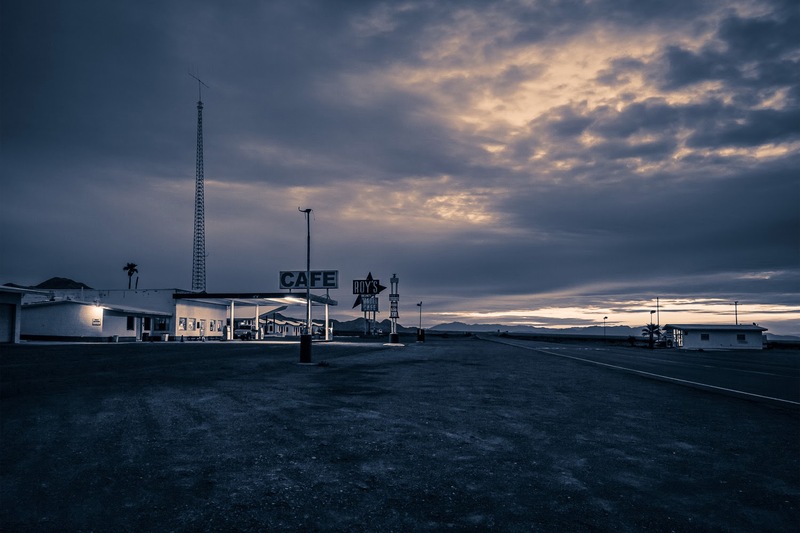 It was a busy place along historic Route 66 in the 50's and 60's but business quickly disappeared when Interstate 40 opened in 1972. The gas station and small market are the only things currently open. The site is now owned by Albert Okura, who plans to preserve and restore the property to its original glory. Mr. Okura also owns the Juan Pollo restaurant chain and the original McDonalds site in San Bernardino. (Local connection: Patrick McDonald had a restaurant called the Airdrome right here in Monrovia at the old airport before moving the restaurant to San Bernardino and changing the name to McDonalds). Sunrise at Roy's. This is the gas station with the market just to the left. 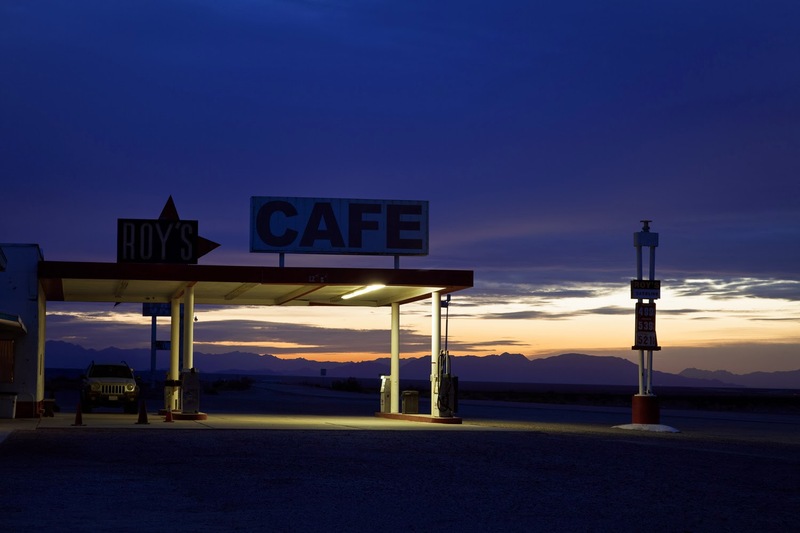 The often photographed Roy's sign is partially hidden behind the gas station canopy. The day I was there, gas prices were $5.39 for premium, $4.99 for unleaded and $5.21 for diesel. Not exactly 1960's prices. Some of the rooms that were available for travelers along this section of Route 66. All are in disrepair with none of the rooms available. This is part of the restoration still to be done. The motel office is straight ahead and the famous sign to the left. The morning was dark and overcast. I had just turned around to take some photos from this direction when the sun broke through bathing all the structures in this amazing glow. It only lasted for about 30 seconds then was gone. The small market and gas pumps in the foreground, rooms behind on the left and the post office across the road on the right. Still a lot of train activity in Amboy. 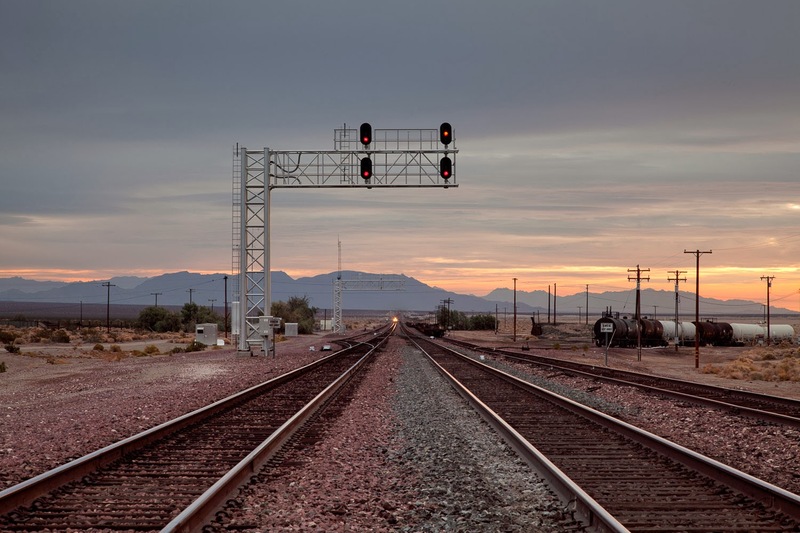 This is facing the colorful horizon to the east with the light of an oncoming train in the distance. 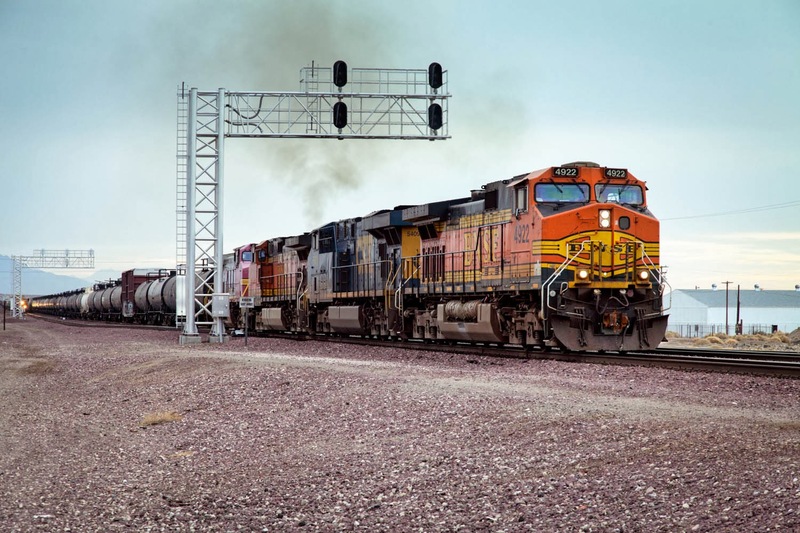 BNSF 4922. One of the many trains that passed through while I was there. Roy's isn't the only landmark in the town of Amboy. 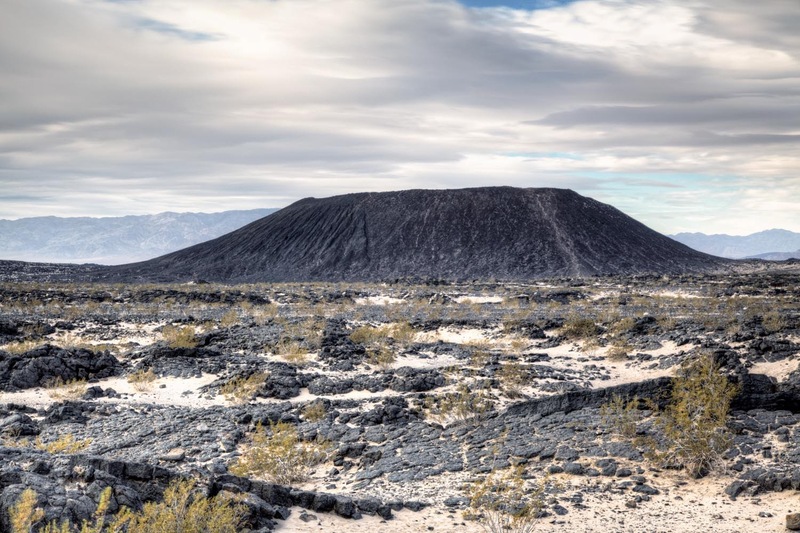 There's also the Amboy Crater, an extinct volcano in the Mojave desert and a National Natural Landmark. The Crater can be seen from Roy's. Mileage from Monrovia: Approx. 177 miles. Travel time: It took about 3 hours to get there, but I left at 3am to get there in time to catch the sunrise. Travel time later in the day may vary quite a bit. Roy's Motel and Cafe Wikipedia page. Route 66 Roy's History: An interesting historical timeline for the area and Roy's. I especially like the entry from 1945-46. Thanks Brad! It's hard to imagine now how busy it was back in its heyday. It really does feel out in the middle of nowhere. I used to go through Amboy a lot on my way to my research areas in the eastern Mojave or when going to Cadiz to dig for Trilobites just for fun. Thirty years ago the cafe was still the place to stop for a snack and a drink. I'd love to see it restored. Love the crater. When we were younger we'd climb all over that area. E.Z. : Wish I could have seen it back when it was busy. Seems so isolated now.